On the 19 of March, 2016 the new book "What was invented by Shukhov» was presented, ISBN: 978-5-9906870-6-6. For the first time the great Russian engineer will be presented to an audience of children. 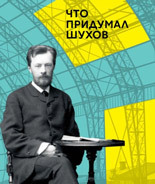 The book is told about the main Vladimir Shukhov's achievements and discoveries — from original inventions in the oil industry to the construction structures, lattice structures and hyperboloid towers. And yet the book shows the formation of the future master.